1635 Michael Noonan finishes with praise for his predecessor Brian Lenihan who died earlier this year. 1634 This Budget changes the economic strategy of the previous Government to put a much greater focus on growth and employment. It balances the need to restore confidence in Ireland’s fiscal position with a key objective of supporting economic growth that delivers jobs. 1633 Conclusion: This Government will not repeat the mistakes of the past. We are changing how politics works to make it more transparent, more accountable and designed to secure the best outcome for the Irish people. 1632 Excise Duty: Excise on a packet of 20 cigarettes will be increased by 25c from midnight tonight. This will be applied to other tobacco products on a pro-rata basis at the same time. 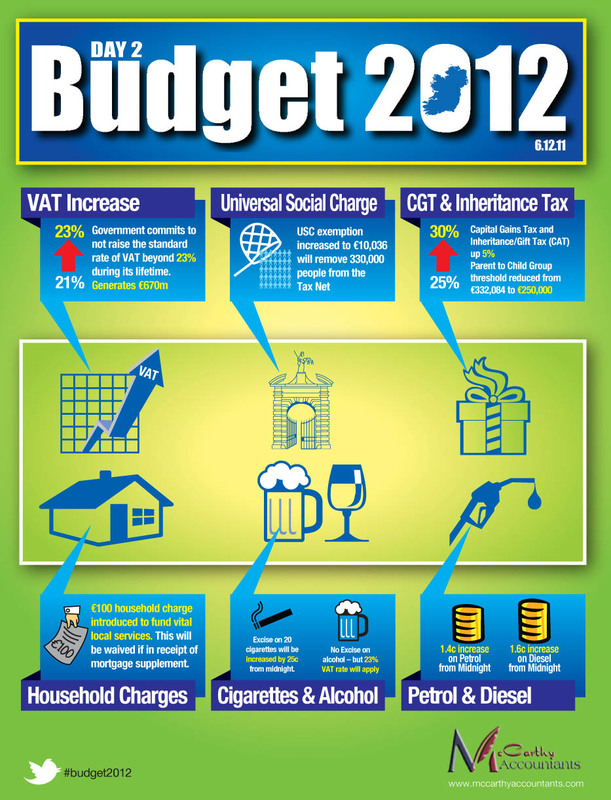 The VAT increase will apply to alcohol but Excise Duty will not be increased here. Will introduce legislation to facilitate the extension of betting duty to remote betting and the introduction of betting intermediaries duty to cover betting exchanges. 1630 Absenteeism: Removing the existing tax exemption for the first 36 days of Illness Benefit and Occupational Injury Benefit so that thisincentive to absenteeism is removed. Minister Joan Burton will bring forward proposals to deal with absenteeism in public and private sectors in 2012. 1629: Export Refund Scheme: Department to engage in a consultation process with the motor industry with a view to putting in place an export refund scheme that would allow for a refund of VRT contained in a vehicle on the permanent export of the vehicle to another Member State. 1628 Household Charge and Motor Tax: Introduction of a €100 household charge, as announced by Minister Phil Hogan. Waiver proposed for those in mortgage interest supplement and those residing in certain categories of unfinished housing estates. Provisions will also be made to allow payment of the charge in instalments. Initiating consultation process with the motor industry and other parties to commence in early 2012 to review options for the improvement in VRT and motor Tax revenues in future years. In the meantime, Minister Hogan will make provisions for an increase in Motor Tax effective from 1 January 2012. This will generate additional income of some €47m in 2012. 1627 Pensions: EU/IMF programme commits a move to a standard rate relief on pension contributions but this will not be done at this time. Increase on home heating fuels will not be applied until May 2012. No increase of Carbon Tax to solid fuels, so no increase for coal or peat. Allowing farmers a double income tax deduction for increased costs arising from the change in carbon tax. Reduction in the VAT rate on district heating from 21% to 13.5%, which will benefit businesses. Farmers able to claim a VAT refund on wind turbines purchased from 1 January 2012. 1623 Broadening the base for PRSI through removal of the remaining 50% employer PRSI relief on employee pensions. Broadening PRSI base to cover rental, investment and other forms of income from 2013. Increasing the rate of notional distribution on the highest value Approved Retirement Funds and similar products to 6%. Increase the rate of tax on the transfer of an ARF on death to a child over 21 from 20% to 30%. Abolishing the “citizenship” condition for payment of the Domicile Levy so as to ensure that “tax exiles” cannot avoid it by renouncing their citizenship. Intends to keep the contentious issue of the tax treatment of tax exiles under constant review. 1622 Increasing the current rate of Capital Acquisitions Tax from 25% to 30% after today. Increasing Capital Gains Tax from 25% to 30% after today. Reducing the Group A Tax-free threshold for Capital Acqusitions Tax from €332,084 to €250,000. Increasing DIRT from 27% to 30%. 1620 VAT to be increased by 2%. Government commits to not raise the standard rate of VAT beyond 23% during its lifetime. 1617 Universal Social Charge: From 1 January, exemption level will be raised from €4,004 to €10,036. Revenue will collect USC on a cumulative basis next year. 1616 As direct taxes such as Income tax and PRSI have an impact on jobs, the bulk of adjustments being made in this Budget will be through increases in VAT and in capital taxes. Marginal rate of taxation on income is now 53% for PAYE workersand 55% for the self-employed. The top 5% of earners pay 44% of income tax according to Revenue records. 1614 Taxation The Programme for Government states that there will be no increase in income tax. This is the key issue for this Budget. I want to make clear that there will be no increase in income taxes in this Budget – no increases in rates, no narrowing of bands and no reductions in personal tax credits. Wages and salaries in January will be no less than wages and salaries in December, so people will continue to have discretion on how they spend their income. 1612 Public finances: Department now estimates the General Government Deficit for 2011 will be 10.1% of GDP, less than the 10.6% required by the EU/IMF. Target for 2102 is 8.6% of GDP. Full measures already announced account for €600m; Announcing additional new tax measures today worth €1bn approximately. 1611 Banking: Two pillar banks have SME lending targets of €3bn each this year, €3.5bn each next year and €4bn each in 2013. 1610 Legacy property tax reliefs: Property relief surcharge of 5% will be imposed on investors with an annual gross income of over €100,000. Reliefs in Section 23-type investments will not be terminated or otherwise restricted for investors with annual income under €100,000. Investors in Accelerated Capital Allowance shchemes will no longer be able to use any capital allowance beyond the tax life of the scheme where that ends after 1 January 2015. 1609: Role of NAMA: Report of Michael Geoghegan into NAMA was largely positive but arising from it the Government is establishing an Advisory Group to advise on NAMA’s strategy and its capacity to delivery. 1608 Mortgage Arrears: Government progressing with the implementation of recommendations made by a review group recently. 1606 For those who wish to buy a home in 2012: First time buyers will get mortgage interest relief at a rate of 25% rather than the 15% proposed by the previous Government. Non-first time buyers will benefit from relief at 15% instead of the reduced rate of 10% proposed by the last Government. 1604 Mortgage Interest Relief: I am going to fulfil the commitment in the Programme for Government to increase the rate of mortgage interest relief to 30% for first time buyers who took out their first mortgage between 2004 and 2008. 1603 Rent reviews: NAMA has policy guidance where it can approve rent reductions when they are shown to be in excess of current market levels and viability is threatened. It allows for the appointment of an independent valuation of market rent where necessary. If a tenant is not getting satisfaction in negotiations he can contact NAMA directly. 1601 Property: Stamp Duty for commercial property transfers will be reduced from the current top rate of 6% to a flat rate of 2% on all amounts from midnight. Current arrangements for residential property will continue. Introduction of a Capital Gains Tax incentive for property purchased between midnight and the end of 2013. If a property is bought during this period and held for at least seven years the gain attributable to that holding period will be relieved fromCapital Gains Tax. 1559: Tourism: The Government was disappointed earlier this year when Aer Lingus and Ryanair were unwilling to provide additional flights to Ireland in exchange for the abolition of the Air Travel Tax. A special allocation will be made in the Revisted Estimates Volume early in the new year in relation to The Gathering in 2013 and it will be launched on St Patrick’s Day. 1558 Tourism: The tourism and hospitality industry believe that the Jobs Initiative has been very effective in generating additional business. 1556 Agri-foods: “Significant reductions” in the rate of Stamp Duty on the transfer of commercial property, which will also apply to farmland. Modifying retiremenet relief from Capital Gains Tax so it better incentivises the timely transfers of farms and businesses before the current owners reach the age of 66. 50% stock relief for all registered farm partnerships and 100% stock releif for certain young trained farmers forming such partnerships. 1555 The first €100,000 of R&D expenditure of all companies will be allowed on a volumne basis for the purpose of the R&D Tax Credit. The corporate tax exemption for new start-up companies is being extended for the next three years and will be available for companies that commence trading in 2012, 2013 and 2014. Smaller companies will be able to avail of the planned foreign earnings deduction where they plan to expand their export markets into the BRICS countries. 1554 I am also introducing a Foreign Earnings Deduction to further support our export drive by aiding companies seeking to expand into emerging markets – Brazil, Russia, India, China and South Africa. 1553 I will introduce a “Special Assignee Relief Programme”. This will allow multinational and indigenous companies to attract key people to Ireland so as to create more jobs and to facilitate the development and expansion of businesses in Ireland. 1552 Much of Ireland’s growth at present can be attributed to theattractiveness of Ireland for inward investment. 1551 We are committed to playing a full part in resolving this crisis, so that the benefit of the common currency will continue for Ireland. 1550 The primary purpose of this Budget is to support the creation of jobs in the short term, the medium term and the long term. 1547 The task of this Government is to gain control of Ireland’s fiscal and economic policies. 1546 Noonan opens speech with reference to 1921 Treaty and Ireland gaining economic sovereignty.